The Blue Ridge Chapter of the Antique and Classic Boat Society, in conjunction with the Hart County Chamber of Commerce, will host the 2018 Lake Hartwell Antique Boat Festival on Saturday, April 21 at Hartwell Marina. This year’s event will commemorate 29 years the festival has been held on Lake Hartwell and will feature more than 50 fully-restored antique vessels, each one hand-painted, sanded and repaired to its original glory. Featured vessels represent decades of boating, dating as far back as the 1920s and as new as the 1960s and 70s. Each year, the Festival’s star is the Miss America 9, which gained fame for being the first boat to exceed 100 mph near Miami Beach, Florida, on March 20, 1931. 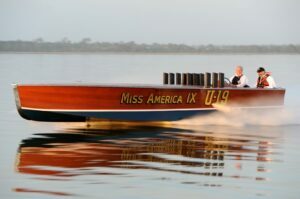 According to the Miss America 9’s website, the record-breaking, 30-footer will once again be featured at this year’s show. An arts and crafts show will also feature vendors from across the Lake Hartwell region, and other event festivities will include a classic car cruise-in and children’s activities. The Hart Chamber of Commerce, invites you to join the more than 2000 people who attend Lake Hartwell’s official lake season kick-off for a day of food, music and fun at Hartwell Marina. This free event will take place from 10 a.m. to 3 p.m. For more information contact the Chamber at 706-376-8590 or at hartchamber@harcom.net. To learn more about other Lake Hartwell events, contact the lake’s Lake Homes Realty Agents Connie Nealy and Jill Botos.